I’m really excited about this weekend’s WWE shows. Personally, I think NXT TakeOver Brooklyn will probably outshine SummerSlam (the WWE’s biggest special event after WrestleMania). TakeOver is packed with a lot of fresh matches with the best talent in the world, while SummerSlam is forcefully stretching to 4 hours long this year. An extra hour normally could be great for a wrestling fan, but in this year’s case, SummerSlam contains mostly filler matches including, a lot of tag matches we’ve already seen, Ziggler vs Rusev (a match we actually wanted to see in a tag form with Lana and Summer), Sheamus vs Orton, the Divas Triple Threat Tag match (which has been unfortunately burned out on TV and oddly paced), and an intercontinental title match I’ll be sure to reserve as my restroom break. Everything else on the card are matches that I’m expecting big payoffs for. I think the overall card is solid and jam-packed with something for all ages. Additionally, I have a sneaking suspicion that after SummerSlam we’ll have a clear picture of one of the main events for WrestleMania next year. Now there are a lot of rumors online in the dirt sheets. Some say Sting will make a splash, possibly getting involved in the Undertaker/Brock match, setting up a dream-match feud for WrestleMania. Others say Sting will make his SummerSlam debut during the Wyatt/Shield match. Some reports claim that there will be a cash in, Cena will regain the title, and that the Rock will have some sort of presence. 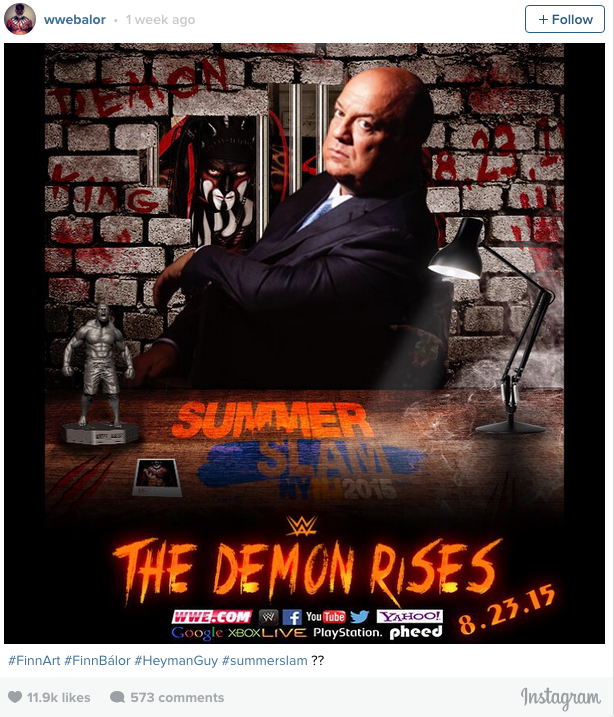 My favorite has to been the one that was formed after Finn Balor shared some fan art on his social media pages. A man can dream…Finn Balor making his main roster debut, interfering in the main event, joining forces with Paul Heyman and possibly starting a feud against the deadman for mania is something that I’m not ready for. If this happens, I may just die from reaching my final form of a wrestling mark. This isn’t a far stretch. Hear me out. Finn Balor isn’t a household name to the average WWE viewer, but there’s plenty of time to make him the biggest star by WrestleMania season. Bray Wyatt debuted at SummerSlam 2013 in a small feud against Kane, then was in one of key matches against Cena at WM30. Balor is the demon, can be down right creepy with his entrances, a fan favorite anti-hero, one the best in-ring performers (maybe of all time), and can propel the WWE to new heights. Personally, I think that Finn Balor is the perfect choice to be replace Cena as the face of the WWE. A match with Balor vs Taker makes sense. Taker is rumored to be retiring at WrestleMania. What a better way for him to bid farewell to us than by passing the torch to the new phenom, Finn Balor. In the meantime, Balor can feud with a returning Masked Kane (known as his demon form). Demon vs Demon, this stuff writes itself. I understand that this is a long shot, but fingers crossed. Now, what I actually think will happen at the end of the event this Sunday is a cash-in, but not just any cash-in, an Evolution FU Orton thumbs down screwjob type of cash-in. I think that the Rollins/Cena match, if booked AFTER Taker/Brock will end with Rollins just barely defeating Cena clean. The authority will make their way to congratulate Rollins, betraying him, calling for Sheamus to cash in his Money in the Bank briefcase, and replacing Rollins with Sheamus as the representative for the authority. What this will do is set up a much anticipated match between Rollins and HHH at WrestleMania. Rollins has been expected to turn babyface sometime shortly after SummerSlam and eventually feud with HHH, and frankly Sheamus NEEDS an interesting change for him to feel like champion. I know these predictions seem out there, but that’s how pro-wrestling works. Swerves come from the darkest corners, and my lifetime of watching wrestling has conditioned me to expect the most jarring plot twists. I expect major story changes by Sunday and the following night on Raw. Can’t Wait! Previous Anxious to Write Again! Next GO and Catch em’ all in Pokemon Go!